Back to Glenfarclas. I’ve previously recently reviewed the 8 yo and the 10 yo—I found the first to be passable (78 points) and the second a bit better (80 points). Will the 12 yo, with its bump up to 43% abv, continue the incremental improvement/rise in my ratings? Let’s see. This one, like the 10 yo, can be found easily all over the US. Nose: As with the 8 yo and the 10 yo, there’s obvious citrus here (orange again) but this is maltier from the get-go and there’s a milk chocolate/cocoa powder note. Less citrus and more malt at first with a few drops of water but then the fruit comes back strong. Here’s something you don’t see every day: both an older, bourbon cask Glenfarclas and an indie Glenfarclas labeled as such. This was released 10 years ago by Cadenhead’s, who seem able to break a number of these labeling rules (see their recent Small Batch releases of Speyside distilleries with the old-style Glenlivet sufffix hyphenated on). Since then I think there has been the odd official Family Casks release from a bourbon cask, and there may have been other indie releases as well from bourbon casks that didn’t have the Glenfarclas name on them (as is usual). Anyway, I’ve not had any before, old or young, and so I’m very interested to see what this is like. It goes without saying that this is long gone. 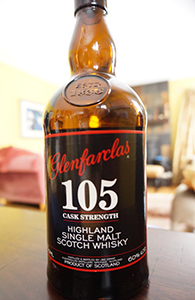 The Glenfarclas 105 is the distillery’s young NAS* whisky—it seems like every distillery has one now—and is more specifically a challenger to the well-loved Aberlour A’bunadh in the “heavily sherried young whisky at a very high abv” category. Perhaps because Glenfarclas have not thought to release the 105 with batch numbers it’s never quite received the cult acclaim of the A’bunadh series. Or perhaps that’s because it’s just a little too young, raw and hot. At least, that was my impression on the very few occasions on which I’ve tried it in the past. Recently, however, some friends and I split some bottles and this was among them. I’m interested to see what I make of it when I’m paying a lot of attention to it.